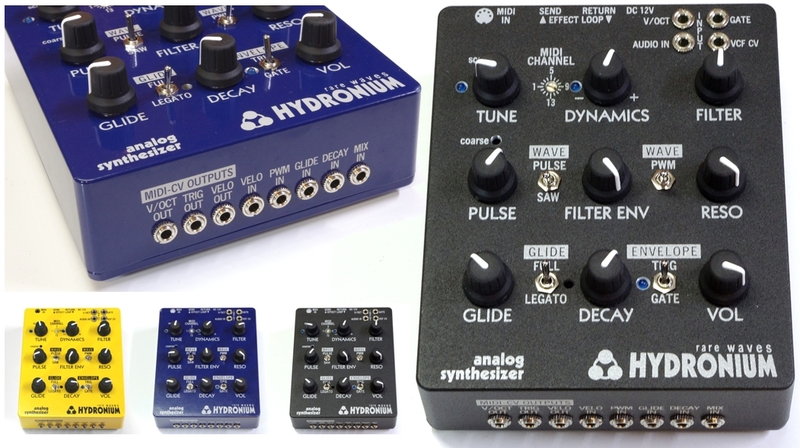 Rare Waves Hydronium is an excellent analog synth for electronic music producers. This is a great-sounding music instrument with MIDI and CV-Gate control. 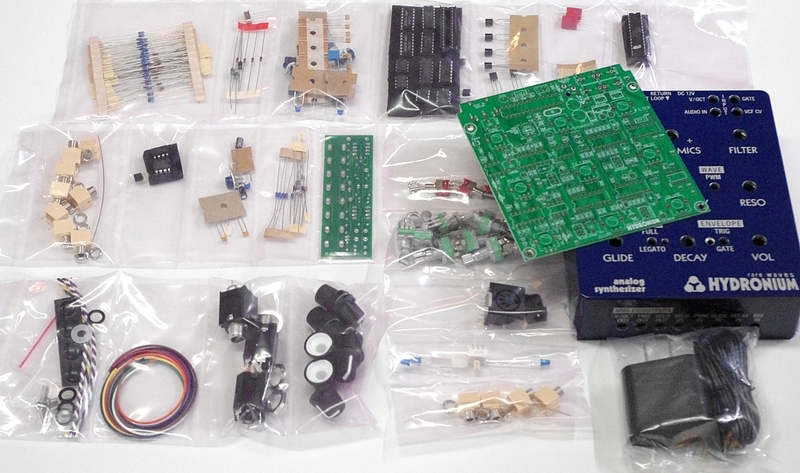 Its available as a DIY kit, or pre-assembled — in tabletop format and Eurorack — and your choice of colors! Its brand new for 2019, created and supported by Eric Archer behind all of our well-known Grendel gear. 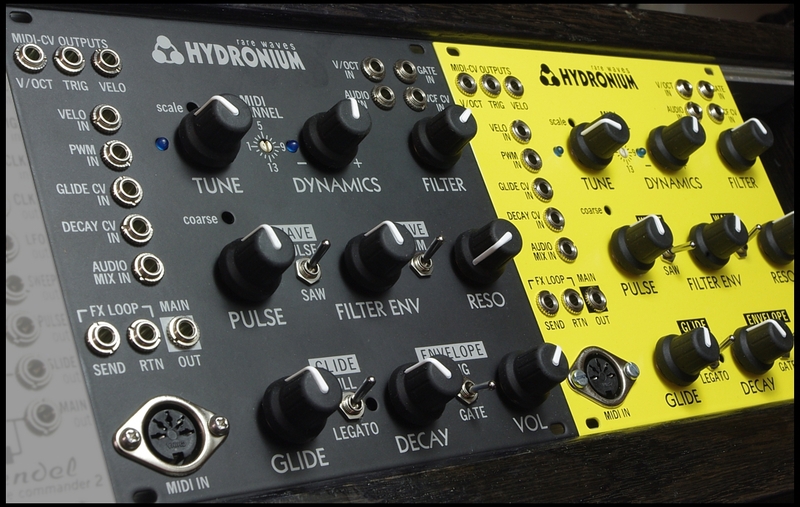 The Rare Waves Hydronium is a semi-modular synthesizer with unmistakable true analog tone. Its rich array of CV patch points can interconnect with other analog synthesizers to inspire your music deeper and further in the creative zone. While it is designed to fulfill the role of a TB-303 inspired acid synth, Hydronium is not a clone circuit. Instead it is an all-new design with its functions re-imagined and extended a little beyond what you might expect from the clone genre. Its tone is based on a single VCO, a resonant low-pass filter, and a simple decay envelope. And as you’d anticipate of any acid synth, it has programmable glide (pitch slide) and dynamic accents for individual notes. Hydronium’s classic tone is a natural choice for sequenced basslines. Switch the envelope to gate mode, and it also serves as a lead synthesizer when you need a bright, clean sawtooth or pulse waveform in the mix. It can be played either by MIDI control or CV-Gate. In addition, its built-in MIDI-to-CV converter with post-glide v/oct output lets you use it as a bridge between your MIDI controller and other analog synthesizers. Hydronium features an audio effects loop that is positioned between its filter and VCA. This is a good place for distortion effects, phaser, and certain other effects that tend to increase the noise floor when patched to a synth’s line out. The pre-VCA effect return silences the self-noise from the effect, preserving full dynamic range even when you bend its tone with a high-gain fuzz pedal, for example. Here’s a look at what you’ll find in the Hydronium kit. The parts are organized in sealed sections of anti-static poly tubing. The chips come packed with anti-static foam. Q. So it’s a TB-303 clone, just like a Roland in every way? A. No, its not a circuit clone, and the controls aren’t meant to exactly copy the 303 controls either. Q. What sort of filter does the Hydronium have? A. Hydronium has an OTA-tuned 12dB/oct state-variable filter. The filter is derived from a reference design published by National Semiconductor in the LM13700 OTA datasheet. It also contains improvements compiled from various articles published in the Electronotes journal several decades ago. Q. How hard is it to build? A. This is not recommended as a beginner project. You should have previous success building a synth DIY project before attempting to build Hydronium. (Try our Tune in Tokyo or Lite2Sound PX!) The parts kit is well organized, and the instructions are very clear. A good quality fine-tipped soldering iron is necessary. Don’t try it with an el Cheapo “woodburner” hobby store iron or some oversized 50-year old clunker from the vacuum tube era. A. At a moderate pace, paying close attention to all the directions, probably somewhere around 4 hours… certainly not less than 2 hours ! Q. How many parts are in the kit? A. There are about 225 parts in all (hardware included), including about 160 components on the main PCB. Q. Are there any surface-mount parts I have to deal with? A. No, any surface mount components will come pre-assembled. Q. I’m located outside N.America. Can I use the included AC adapter? 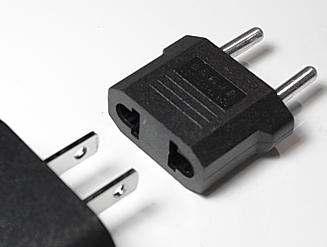 Or if you already have a 12VDC adapter, with 2.1mm center pin positive, then that is OK to use with Hydronium. It only needs ~50 mA of current. Q. What is controllable by MIDI? Q. What is controllable by CV? A. Pitch V/oct, Filter V/oct, Gate/Trigger In, Velocity (0..+5V) *no accent gate in*, Decay CV In, Glide Time CV In, PWM In. Q. What CV outputs does it have? Q. What are the audio patch options? A. Pre-filter audio in (mix), pre-filter audio in (VCO mute), Effect send/return (between filter and VCA), Main out (1/4” unbalanced). Q. Why is there a MIDI- CV converter in Hydronium Eurorack? I already have a MIDI-CV converter module, so isn’t it a waste of space? Q. Is this kit lead-free? A. Yes, the PCBs and parts are all lead-free and RoHS-compliant. Q. Will the Hydronium run on batteries? Q. Does it take USB MIDI? A. No. Hydronium uses standard MIDI cable only (DIN-5). Q. Can I just have a bare PCB and the parts list? A. No, it is only available as a full kit or pre-assembled.